A few summers ago, my husband and I hosted a cookout for family and friends on the 4th of July. This was when the design for the “Celebrate” Cozy & Coffee Sleeve came to me. I designed them for their practical use, but loved the extra touch of decor they added to the day. Have you ever been to a cookout in the middle of the summer when it’s nearing 100 degrees, or more? You need the ice cold beverages to keep hydrated and cool in the heat, but find the sweating bottles and cans annoying. You find yourself carrying around napkins to keep your hands dry. 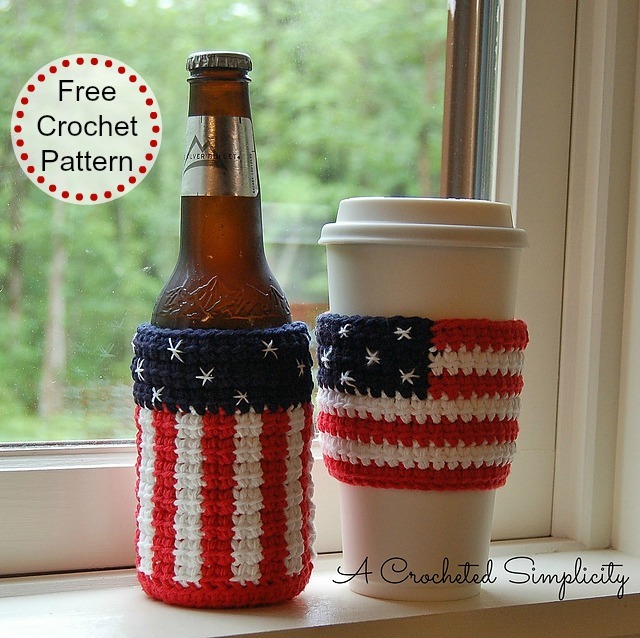 There’s a simple solution for this, make yourself a cozy in cotton yarn! The cotton will help insulate the can and it will absorb the sweat. Beginning chains are not included in stitch count unless noted otherwise. First stitch of each round is worked into the same stitch as the beginning chain, unless noted otherwise. I tend to crochet tightly. If you do not, you may need to adjust your hook size to achieve gauge. Lily Sugar n’ Cream was used for the cozies in the photos. You can use another worsted weight cotton yarn as long as it’s similar in thickness and you meet gauge. 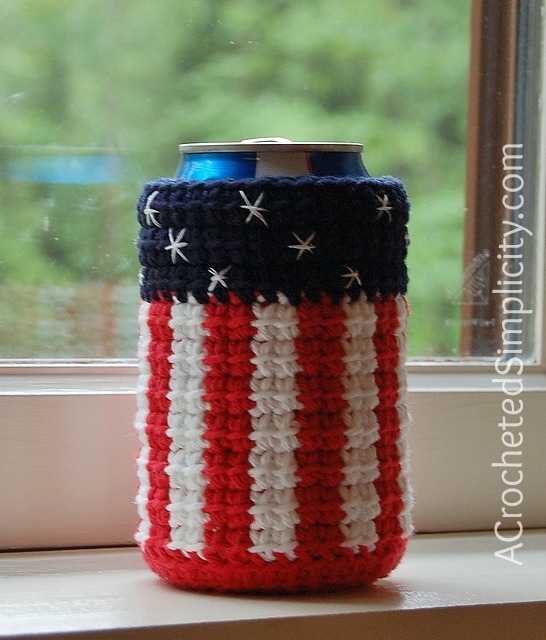 Acrylic yarns may be used, but I suggest cotton yarns for cozies because it absorbs the sweat from beverages. Color changes noted throughout are suggestions only and reflect the color changes of the cozies in the photos. Rnd 3 (CC): Ch 2, 2 linked dc in the same st as ch 2, 2 linked dc in next st, linked dc in next st, [ 2 linked dc in next 2 sts, linked dc in next st ] work from [ to ] 4 times, 2 linked dc in last st. Join. (27 sts) Click HERE for linked dc join photo & video tutorials. See photos A thru E for color changing tutorial for Rnd 5. Rnds 6 thru 11: **Working in Both Loops**, Repeat Rnd 5. **Note: change colors to CA at the end of round 11. Photo A: Shows changing to CC on the last pull thru of the 2nd linked dc in CB. Photo B: Shows the completed color change. Photo C: Shows 2 linked dc worked in CC and working a color change back to CB. Photo D: Shows the color changed back to CB. Photo E: Shows what the inside of your work will look like when carrying the yarn to work the color changes. Fasten off. Use Invisible Join Technique (click HERE for tutorial). Weave in ends. 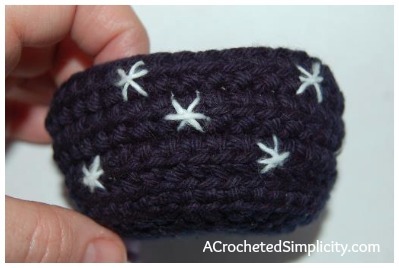 Follow instructions below for handstitching the stars. Rnd 2 (CC): Ch 2, linked dc in the same ch as ch 2, linked dc in each ch around. Join and change colors to CB. (40 sts) Click HERE for linked dc join photo & video tutorials. See photos C & D for how to work color changes. Note: For the remaining rounds, you may choose to carry the round after color change or to cut the yarn at each color change. Cut a 12″ strand of white yarn and pull it apart. This will give you 4 separate strands to work with. I stitched 1 star over 1 linked dc. Stitch diagonally, corner to corner over 1 linked dc. 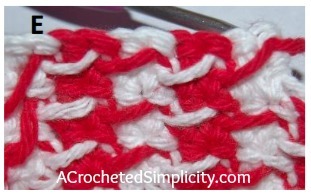 Stitch diagonally in opposite corners. Finally, stitch horizontally across the center of the same linked dc. 1 star complete. Randomly stitch stars around the cozy on the navy sections (CA). 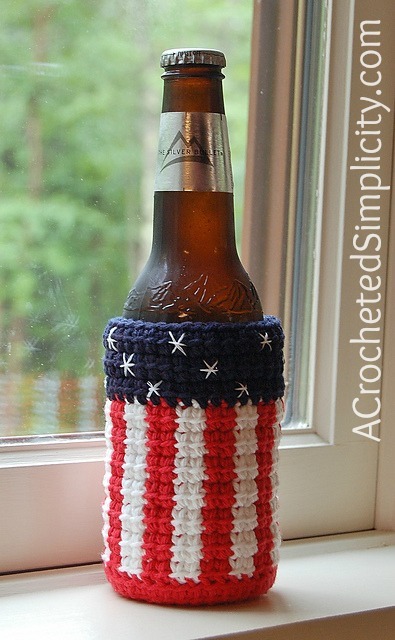 Please share your finished ACS projects with me in the A Crocheted Simplicity Crochet Community Group on Facebook! I love this pattern and the linked double crochet. Thank you for sharing it! What size is the coffee sleeve supposed to be? It will fit a standard 16oz cup. These are so nice Jennifer! May I sell items made from your patterns if I give credit to you for the pattern?